Maybe it’s because we’re so accustomed to eating regularly throughout the day and our stomachs remind us when it’s getting close to mealtime. Maybe it’s a comfort activity; something that can be done to preserve a sense of normalcy in a situation that seems beyond our control. Whatever the reason, food is the first thing that most people think about in survival. In reality, there are much more important things to worry about. If you recall the Rule of Three you know that air, shelter, water come first. Nevertheless, you’ve got to eat sometime so carrying a lightweight, nutritious meal with you that can provide a bit of warmth on the inside is a good idea. It’ll help give you boost of energy and lift the spirits. You heard the axiom “Store what you eat and eat what you store.” They are words to prep by. That’s why one of the items I like to carry with me in my 72 hour kits is instant oatmeal. Lightweight. With some foods, you’re carrying around a lot of extra weight in the form of liquid. Not with instant oatmeal. It’s lightweight and easy to carry. Servings. Since instant oatmeal is packaged in individual servings, it’s easy to carry and use only what you need. Preparation. It’s easy to make instant oatmeal. If you can boil water, you can make instant oatmeal. Packaging. The packaging is flammable. That can come in handy when you are trying to start a fire in the wilderness. I typically carry my instant oatmeal in a homemade MRE (Meal Ready to Eat). The MRE contains 2 packages of instant oatmeal, a granola bar, a teabag, a paper towel, and a plastic spoon. It’s all vacuum sealed so it should stay fresh for a long time. Although I haven’t actually tried it, I suspect that I may be able to boil water in the plastic vacuum seal bag. I’ll give that a try sometime and let you know in another post about homemade MREs. In a true survival situation, you’ll burn a lot of calories just trying to stay alive. Making a shelter, gathering firewood, searching for water, all take energy. Instant oatmeal, when prepared with water, only contains around 130 calories per serving. That’s not a lot. It is high in carbohydrates, though. But you’ll need to supplement your instant oatmeal with other sources of calories if you’re going to be stranded for quite some time. So, what about you? 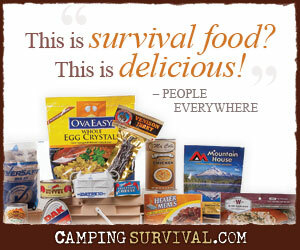 What do you carry for survival food? ← What to Do When Politicians Infringe on Your Liberties? Oatmeal… It is all good. I have always enjoyed oatmeal as a substantive breakfast. My personal preference is the old fashioned Oats, the kind you have to cook for 10 minutes, but in a Bug Out scenario or just convenience on the trail, instant oatmeal works well. It takes so little space that you can indulge with two packets for added calories. When I lived and worked in the Boundary Waters Canoe Area of Northern Minnesota a few years back, I really enjoyed a local breakfast up there called ‘Red River’ Cereal. It’s made with cracked Wheat, Cracked Barley, Cracked Rye and Flax Seed. Add some cream and brown sugar or dried fruit, It is very tasty. It also stays with you longer than Oatmeal on cold brisk mornings. Because I like to diversify, I made my own version of the ‘Red River’ brand cereal (leaving out the Rye), I would like to share with you. Grind or crack all grains and seeds to consistency in a meat grinder or a ‘Back to Basics’ Hand Mill. simmer for 10 minutes (Can also be allowed to soak in a thermos with the cup of boiling water for an hour or so til tender or overnight so it’s ready first thing in the morning). Because of the nutrient dense wheat/ Quinoa, Flax and Chia, this combo will really sustain you most of the day. I have Vacuum sealed all the dry ingredients (including dried fruit and sweetener), in small individual packets for my BOB and take a few packets on the trail with me when hiking Just add hot water and you are good to go. Old Fashioned will stay with you longer than instant oatmeal. Put the Old Fashioned Oatmeal in the water when you start the fire. When the water is boilng with the oatmeal in it, the oatmeal is almost done. Add raisins or whatever, Put the lid on for a few minutes. If you need to conserve the heat source, in a few minutes the oatmeal will be good to go. Like I said, the instant oatmeal does not stick to the ribs very long. It raises blood sugar quickly and then leaves you hungry sooner. You can pack your own oatmeal in snack bags. One-half cup Old Fashioned Oats requires one cup water. Salt, raisins, and sugar makes it good for me. There are several ways you can cook this. Put boiling water and all ingredients in a thermos and it will “cook” that way. Or, cook oatmeal and wrap the pot for a few minutes. Thanks Practical! At home, I definitely prefer old fashioned oatmeal but I must admit that convenience has drawn me to instant for MREs, camping, backpacking, etc. I’ll have to give the old fashioned a try next time. Oatmeal, to be good for you, needs to be cooked well. Instant oatmeal is mostly raw the way you only add boiling water to it and it does not “stick” to your ribs, so-to-speak, as the starch in it does not break down. By cooking it well, it is digested better leaving you with a fuller feeling longer. Be sure to add cinnamon powder as an added fortifier. I don’t know if honey comes in a powder form, but that would really be a beneficial addition to your MRE oatmeal. Beware that if you don’t eat cracked grains regularly, they will affect your gastric system negatively. Wink wink! So, incorporate them slowly into your diet. Tin Man that’s a keeper! Thanks for your recipe, will definitely gives this a try! I have had problems storing oatmeal: grain weevils. To defeat them, I store all grains in the freezer. That seems to eliminate the weevils, their larva, and their eggs. Carbon dioxide packing might be a good idea. Also, couscous is non-perishable and simple to prepare. Like the other foods mentioned here, it is mostly starch. I have posted my secret formula for smoked salmon jerkey previously, so I wont do it again, except to remind that you need salmon with the fatty layer under the skin removed. Costco is a good source. I started storing ‘bulk’ grains, (wheat, rolled oats, barley, etc.) about 5 years ago. When storing in a five gallon bucket (with ‘Gamma Seal’ type lids) I place 1 cup of D.E. (Diatomaceous Earth) in with the grains as a weevil, insect determent. Smaller amounts of grains I just use a proportionately smaller amount of food grade DE. I rotate my food stores regularly, including bulk grains and have not had any problem with insect infestation in 5 years. DE is harmless to humans and pets (good for storing pet food also) DE is also a wonderful anti-parasitic when taken internally and can be given to domestic pets and farm animals as a parasite prevention protocol. DE kills soft bodied insects and their larvae. Yes you can boil water in most vacuum seal bags. i have done it quite a bit using hot rocks and it works quite well. Thanks for the confirmation, George. I’ll give it a try. So what is the ‘shelf life’ of the instant oatmeal in a vacum sealed bag? Great question, BrIan. I don’t know how long the instant oatmeal will last in a vacuum sealed bag but I suspect quite some time (years). However, I treat them like I do all of our pantry and rotate them out periodically. Should the oatmeal begin to have an “old” smell…just rinse it to wash the starch away…that’s what becomes rancid first. I love the instant oatmeal idea, have used it for a long time, but I went a step further: I took instant oats or c of wheat, added powdered milk and sugar, and I now have a fairly complete meal. I put it in a seal a meal bag and sealed it up. I did the same with mac and cheese. Powdered breakfast drinks and cocoa are another great option, and instant coffee or tea can be carried the same way. While they offer little in the way of nutrition, there are times when nothing sounds or tastes better that a cup of joe or tea. Either could contribute greatly to your mental health, and could make a world of difference in a survival situation. Thanks for sharing the ideas, GrayFox114! A vacuum sealer and some dried food can go a long way toward making some homemade MREs. Instant oatmeal (or even instant Cream of Wheat) can be jazzed up with dried fruits and nuts. You don’t have to boil the water either (especially the Cream of Wheat) it just takes a liitle longer. Due to IBS I lived off of both for months. Still eat it to give my intestines a rest when needed. I’m still alive and kicking! Oatmeal, definetely a MUST have in anyones food storage. Now, I never liked oatmeal! Could not eat it without gaging…. Last year I found “The Oat Meal Miracle”. It’s Macaroon cookie mix from http://www.srmarketplace.com. Just mix some in your plain oatmeal and everyone loves it. We have also stocked up on freeze dried blueberries, strawberries and raspberries. Having that on hand turns boring oatmeal again into a yummy breakfast for the rest of my family, … I’ll stick with the Macaroon mix. You Have GOT TO TRY IT! Heaven!!! You’re making me hungry, JoshG. I am very new to prepping and I appreciate blogs like your so incredibly much. I think if I were to make an mre like this, I would somehow find a way to add a scoop of protein powder to each kit. I believe the protein would add a lot to the meal, along with dried fruits and nuts. Do you feel this is a poor idea? Hi Erica – Thanks for the comment! However, once you’ve broken the seal, the clock starts ticking so I’d be careful including something that you’ve opened in the MRE. Can you find individual packets? Or maybe a protein bar instead? Well, i wouldn’t totally ignore the old Ramen noodle standby which already come individually packaged. While not exactly a ‘health’ food, One packet makes a decent bowl of belly filling soup, Little too much MSG/salt but if you’re not at risk from it, it doesn’t urt. Or you can drain the water and have a pasta if you like it that way. It still is hard to beat as the best bang for the buck emergency ration? When my husband had a problem with low t and was a bit down, I started putting protein powder with aminos, maca powder, and chia seed in his oatmeal every morning, along with the flax seed, raisins, dates, and pecans we usually add. Made all the difference and it also gives me energy for almost all the way to dinner. Part of being a prepper is testing your ideas before they are needed for an emergency. Protein powder may not keep as well as the oatmeal. Once again, test it before you rely on it. And report back to us, of course. Sounds like ‘survival eating’ might be the healthiest diet yet, lol?! The ‘Red River’ breakfast is really good but you should leave out the wheat–which is one of the biggest health hoaxes–and stick more with seeds and nuts. Chia and Flax being two of the best. Flax and Chia also happen to sprout and grow quickly almost in any environment so you can eat the sprouts as the vegetable version from the seeds and/or actually produce a crop. Chickens also eat Flax and Chia and other seeds and their eggs then turn out to be one of the best super healthy foods. Corn is Not the best crop, pound for pound. And it is not healthy. By the way, make sure all the Oatmeal and seeds are as organic as you can find. You also need a good shot of the majority of your daily protein intake as early as possible in your day–especially if you’re going to be active. The optimal standard is about one gram for ever two pounds of body weight if you are active. Almost nobody gets enough protein in their regular diet. But almost all of us already are stocked up on the fat we might need,lol! Not many protein bars give you more than 30 grams, and these are usually way too expensive. Granola type ‘energy bars’ are just another relatively useless form of ‘candy bar’ for a brief sugar spike. If you want that, you might as well just stock up on Nestles Crunches which taste better! The more economical big containers of protein powder you see everywhere turn out to be about half the price of a good protein bar per 30-50 gram serving with a bit more assorted Amino acid content. They store fairly well if you keep dessicant pouches in the containers and tightly closed. Not sure about portable individual storage packing. Otherwise, the cheapest is a good bottle of total Amino Acid tablets. More compact, as well. And take your daily morning ‘popper’ with your oatmeal breakfast. The powdered milk was always a good survival standard for protein as well but for some reason the prices went through the roof on these also? And now hey’re not that much behind regular protein powder. And don’t forget a good bottle of multiple vitamins and minerals! I have a couple of honey sticks in my vehicle EDC bag in my car. I’ve stuffed a tea bag in a bottle of water and let it sit for a few minutes and then sweetened it with a honey stick. Holds off the hunger for a few hours and keeps you hydrated. I’m a beekeeper and have discovered the easy trick to making my own honey sticks! Love my Leatherman! I live in an urban area but often travel the long lonely stretch down 12 and 99 to Exeter. I would hate to get stuck out in the middle of a dry dusty orange grove waiting for AAA to come find me without any water or nutrition! When you get out there in the middle of all those trees, it is very hard to tell where you are without a compass or GPS. Also a great way to store a small amount of spices like salt/pepper, matches, larger straws hold small pills like Sudafed and aspirin caplets. Excellent comment, Tessa. Thank you for your insight and recommendations. Thanks, one thing I should have mentioned about honey. It is not always what you think you are getting. Read the label, store bought honey often has water and corn syrup added and you lose the health/nutrition benefits. Has it been heated to thin or mass produce thereby destroyed the enzymes? Natural organic honey is very thick and will turn to a solid after a year. It is still good and healthy and can be “melted” by placing the container in hot water to gently melt and keep the benefits. YOur method of sealing stuff in a straw is great! Try to get extra fat straws like they use in the Asian boba joints. I use this method for medications that go in my bugout bag: aspirin, Flomax, Prilosec, antihistamines, and also for triple antibiotic oinkment. This works a lot better than homeopathy, magnetic therapy, aura adjustment, or acupuncture. Make sure that everything is organic, vegan, non-GMO, unprocessed, range free, chemical free, and gluten free. It should also be slightly alkaline. Consider adding spiritual silver, organic sulfur, and Heart and Body extract. Thanks for the tip, I will be shopping for those fat straws! I would have never thought of this and plan on going through the EDC’s in my vehicles this winter. I have wanted to add some medications, just in case. You never know when you need something. A little boy from the adjacent campsite cut his foot on some rocks in the water on our last camping trip. His parents had zero first aid supplies. My teenage granddaughter carried him up the steep bank right to me. My grandma has all kinds of stuff for cuts! LOL, smart girl! My daughter and I went through the process: Clean, disinfect, antibiotic cream and a few butterfly bandages, a good wrap up with a top off of Duck Tape. (how do you keep a toddler from running around, you don’t, just add Duck Tape) The worried mom wrung her hands and well, she wrung her hands. All oatmeal except steel cut is cooked. The only difference between instant and Old Fashioned is the size of the particles and hence the time it takes to absorb water. Hot oatmeal is a grand comfort food, and heat may speed up time to absorb water; but the oatmeal will hydrate with cold water also so ypu can use it in situations where you cannot heat your oats. As been told to me by Naturopaths and Alternative Doc’s….Instant Oats is on the same level as white, bleached, then enriched, wheat flour. All the germ and nutritious natural healthy ingredients are removed and then replaced with synthetic vitamins and etc. Thus creating gastro intestinal problems and cancer and etc, in many people sooner or later. Excellent point Harv! That’s why I will be making these little babies for my babies. I’ve already made up labels, Goldilocks’ Just Right Porridge for (insert grandchild name here)! All the mom’s of my 13 grandchildren work and some of the kids are pretty picky. One won’t eat any dried fruit but loves nuts, one won’t eat anything but brown sugar and lots of cinnamon….you get the idea. It’s a zoo in the morning with five picky kids each trying to assert their individuality and get a few minutes of mommy’s attention. All of them except the dried fruit abstainer love my dried cinnamon apple rings made from Grandpa’s special tree. Since he went to be with his maker the apple rings have been an even bigger hit with the kids and I can’t make them fast enough. I’m thinking a lot of homemade instant oatmeal made with those yummy golden delish dried apples. I think I’ll make some short honey straws to go with them from my apiary. Yum, why did I skip breakfast this morning, now I’m hungry! Rolled oats keep for longer and can be packaged with whatever flavoring you wish. I keep rolled oats, pinto beans and rice as part of my food stores.